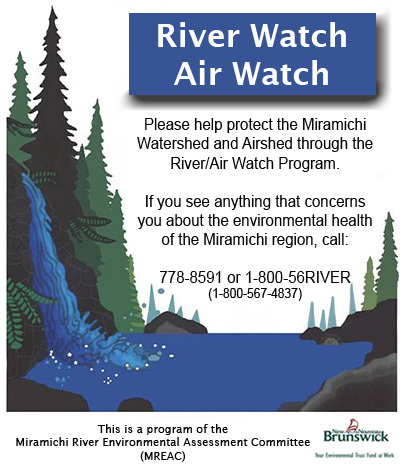 River Watch / Air Watch are MREAC's community flagship program. Each year, citizens and stakeholders from the Miramichi address environmental concerns through this program. MREAC press releases, newsletters, a spring poster campaign and our web-site all advertise the program. The community is encouraged to call the promoted numbers to report any environmental concerns. The phone numbers 1-800-56RIVER, and locally 778-8591, to reach the MREAC office. Upon receiving a call reporting a concerned environmental occurrence, MREAC staff records the details for file and, depending on the nature of the call, either investigate directly or forward the call to the appropriate government agency. It is made clear up front that we are not an emergency response team or emergency response service. MREAC has some ten partners in this program, including industry, institutions and jurisdictional agencies. Having provided this program since 1993 on the Miramichi, much of the community now looks to MREAC for this service. MREAC attempts to inform the original caller in each file as to the progress and outcome of the occurrence. Several hundred files are now recorded in the annuals of the River/Air Watch Program. Some have been false alarms, others have occupied MREAC staff and volunteers for years. MREAC will continue with this community service for as long as the interest remains.